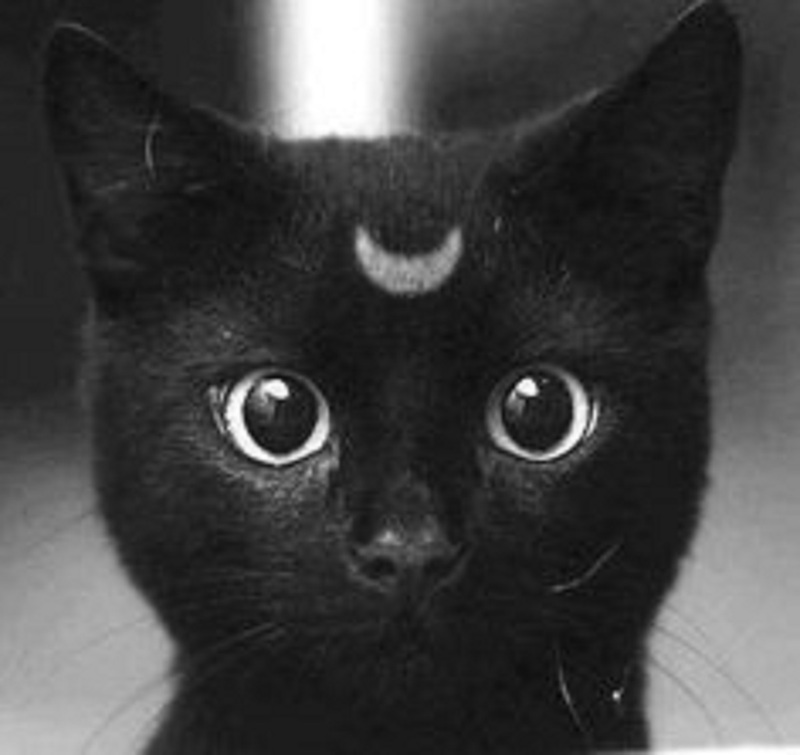 Home / Articles / Is Your Cat a Psychic? Is Your Cat a Psychic? Does your gut tells you that your cat sense something that you don’t? That maybe it is capable of distinguishing the presence of spectacles that are beyond what you can foresee? Well, it’s probably true. Cats do have the ability to see, hear and sense a wider portion of the electromagnetic spectrum. It’s possible that they have a well-developed sensitivity to subtle changes in atmospheric vibration, thus giving them the appearance of being psychic. The New England Journal of Medicine published an article in 2007 about‘Oscar’, a cat who has made his home in a nursing home on Rhode Island. His favorite place to be is on the advanced dementia ward. His skill, if you can call it that, is being able to predict when a patient is about to die. When staff witness him curling up and purring next to a patient, they know that person is about to pass. As of 2010, Oscar predicted 50 deaths since he came to live at the nursing home in 2005 as a kitten. Oscar makes his rounds every day, just like the doctors. One time, he was found curled up next to a female patient’s leg. She died later of a blood clot. Oscar’s usual behavior towards his human companions is generally cool and unfriendly. Oscar’s abilities are probably due to a certain sensitivity to changes in the patient; maybe their smell is different, their breathing is altered, or a certain chemical is released in their body before they die. No one really knows why this exceptional cat can foretell death and why he acts the way he does. Perhaps he truly is a psychic cat? Many stories abound of cats who can detect illness in their owners. Jean was about to settle down to sleep with her cat, Topsy. Suddenly Topsy began jumping around, circling, leaping on and off the bed forcing Jean to get up. As Jean stood, she felt dizzy and shaky. She realized she’d forgotten to check her blood sugar level before bedtime. It was highly possible she could have slipped into a diabetic coma without Topsy’s intervention. Several years ago, a kitten called Fidge saved her owner’s life by sitting on her breast every evening for two weeks. Her owner was experiencing slight pain in her right breast so she thought she’d get herself checked out. Her doctor discovered a small malignant tumor that would have eventually killed her if left untreated. Fidge’s family have since treated her like the hero she is. In 2012, Japanese scientists conducted a survey of animal owners in Japan in the wake of the 2011 earthquake and subsequent tsunami. Most incidences involved the cat acting in a restless manner and insisting on being close to their owner. Some cats displayed agitation up to six days before the event. Many reasons have been given how cats (and other animals) predict earthquakes. They include the likelihood of very minor pre-shocks that cats feel, changes in static electricity, shifts in the electromagnetic field, or of course, sensitivity to all three. Psychics, spiritualists, and owners themselves are often convinced that cats are psychic in the sense that they become aware of the presence of a spirit. Behaviors vary according to whether the visitor is welcome or not. 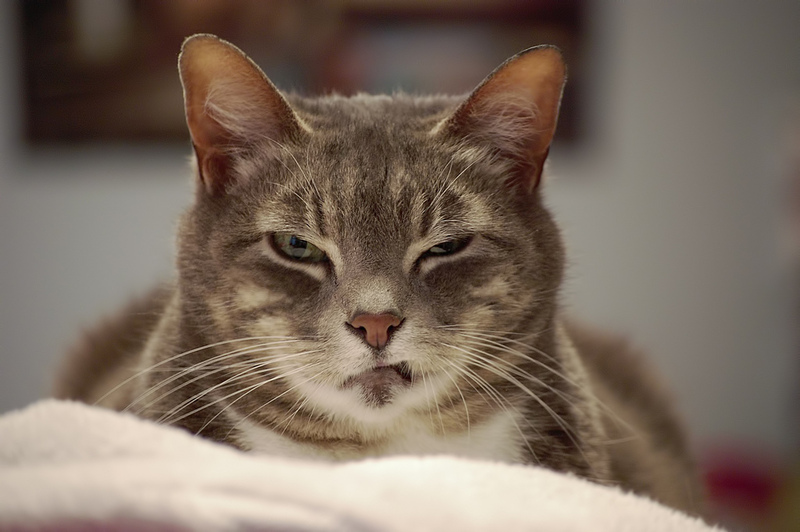 Owners report their cat staring into space and purring, appearing to act feisty for no apparent reason, or taking an aggressive stance – growling, hackles raised and claws extended. One example, given by the writer of the Dead Conversations blog, is of a young child suffering from night terrors and medically unexplained seizures, attributed to the presence of a spirit. The family cat stood guard at the child’s door and, while the night terrors occurred, would be observed growling, hissing and violently swatting at the air. As soon as the nightmares ceased, the cat would lie down and sleep peacefully. Eventually, the spirit was persuaded to leave; the nightmares ended, and the cat stopped displaying the strange behavior. 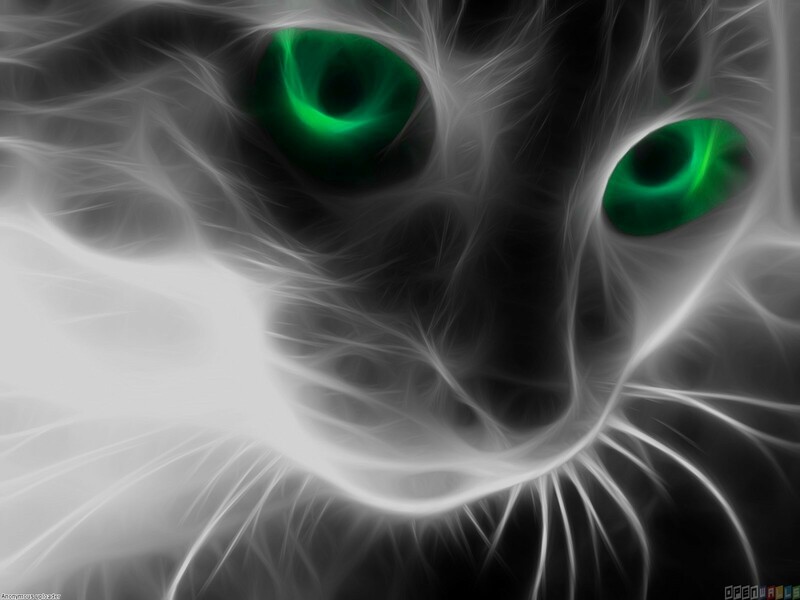 There is a theory that, like some other species, cats can see things in the ultra-violet spectrum that are invisible to humans. A 2014 paper suggests that, based on their findings, that cats are UV sensitive, whereas humans are not. She displays unusual behavior; walking in circles, won’t leave your side, appears anxious. Her body language changes – she may flatten her ears, lower and swish her tail. She sits staring at something you cannot see. This may last minutes or longer. She starts to purr for no apparent reason. She seems to be interacting with someone invisible to you, rolling on her back, rubbing her body against nothing. She displays aggressive behavior toward an invisible enemy. Her hackles rise, her tail fluffsout, and she growls quite alarmingly. She acts as though she’s guarding a member of the family. She knows when you are ill or upset and prefers to stay right next to you. When the house is quiet, the TV is off, and you are not likely to be disturbed, you can practice your telepathic skills with your cat. You and your cat should be relaxed, but he should not be sleeping. Don’t touch him, but instead, imagine that you are stroking him and send a feeling of love full blast right at him. He may respond by merely looking at you, or he may move closer, start purring or demonstrate full-on purry, pushy love behavior. Another time, making sure he is relaxed but awake, try visualizing yourself walking to his food bowl and filling it with something he really loves. A few pieces of ham, fish or other tasty treat. Repeat it a few times until you have it as real in your mind as possible. Imagine the texture of the food, the smell. See yourself putting the food in the bowl and imagine your cat running to the bowl to snaffle up the food. Your cat may come to you, acting as he usually does before you feed him. He may even go to the bowl to check if the food really is there. If he does either of these things, then be sure to reward him by giving him his treat. Next Will He Change Because You Love Him?